The Dollar recovered some of the losses against the Yen after major equity indexes posted a nice comeback yesterday, alongside better-than-expected US data. Earlier this morning, Japan released some negative data, with the National CPI falling 0.7% vs 0.8% YoY and 0.2% vs 0.3% MoM. Also, the Manufacturing PMI missed the forecast by printing 48.9 vs 49.2, putting pressure on the Yen. Today, investors will wait for the US to release its own Manufacturing PMI numbers alongside the Existing home sales for any short-term directional clues. 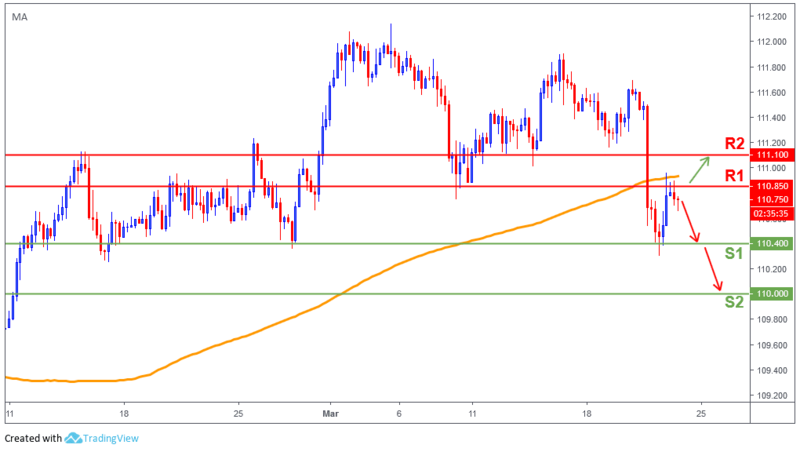 The USD/JPY bounced from 110.40 (S1) to find resistance at 110.85 (R1) and the 200-day moving average (orange line). If price fail to breakout above 110.85 (R1) we could see a possible, retest of the recent lows 110.40 (S1). If, however, the bulls will be able to break above 110.85 (R1), then the next possible price destination is 111.1(R2).